So, a timeout from working out (or at least blogging about it) to share with you one of the knit projects I worked on during our move. About the only upside to being away from my sewing machine for months was the time it allotted me to knit. 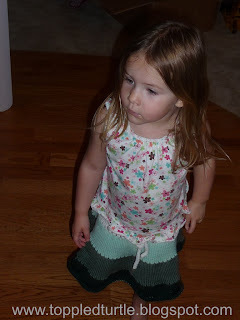 I decided to knit a skirt for each of my girls. For Olivia, I selected a free pattern off ravelry (Barefoot Knits Twirly Skirt), picked out some reasonably priced yarn and went to work. I had just finished learning how to knit fair isle, so I added a little pattern at the bottom of the darkest green band in white. 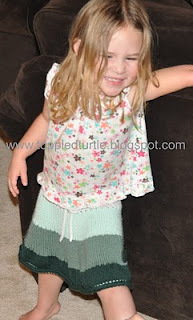 Unfortunately, the skirt naturally rolls up a bit and the pattern is mostly lost in the fold. Ah well, lessons learned. I absolutely love the way this skirt turned out. It took me about a week to complete and was super easy. Of course, Olivia wanted nothing to do with it for the first 2 months, but now she's taken to it and is starting to wear it regularly - YAY! !